Patti, sounds like you are suggesting that all characteristics seen in my aunt's fate line are only natural for a life line to have. And implicit you are kind of denying here that it is actually much more normal for a fate line to have so many 'outward curving' characteristics - than for a life line. Apparently somehow you prefer not to post any detailed description for my aunt's hand; which I recognize as a huge handicap to find any agreement at all between our view... because it was actually this example that made us start this discussion. Patti, would you mind to comment with on this new example of a 'short life line' that I presented earlier today - how would your prefer to describe it: just a short life line... or would you prefer to describe the central vertical line also as a life line? Patti, I am puzzled about why you think that '... it is unimportant to break down bits and pieces of the crease...'. Because, regarding the option of a 'fusion' of lines... that requires an analysis of the details! Because we can actually see that the lower two parts of the fate line are actually 'splitting' upwards. And this does not look like an upward branch growing from the life line at all - which by principle can never be described as a true 'splitting'. And finally, also, I can not find a single feature in the 3rd and 4th line part which suggests that any part of those lines is progressing there downward. While the wider structure of the 3rd line part (compared to the 4th line part) suggests that the line is progressing upwards!! It's hard for me to understand why you show so much persistence in avoiding to discuss the details seen in the various examples that have been presented in this topic. Can this fate line not fit the description for the thenar crease, should be the question. At all places it can easily fit the description for a life line. Now could a fate line that only appears above the head line aiming towards/from the fingers be a life line, no of course not. Patti wrote: So bottom line, you aunt's line is located and contained in a location that is common for a life line. Trying to associate it's constitution still isn't important here, it is it's placement. Patti... ... I can not believe you're suggesting that 'placement' is the single most important factor. This almost looks like a beginners-mistake, for you are ignoring the fact that the 'sagittal' line is the only line of which the full LOCATION relates to the mid-axis of the palm. ... Wait a minute, I think in your first post you kind of described in your comment (which I liked very much), that if in my aunt's hand the fate line would have clearly progressed through the head line then it could no longer serve as a life line. But now you are saying for my new example that it doesn't bother you at all to describe it as a combi of fate- and life line... even while it clearly progresses through the head line? Did I misunderstood your first comment? Perhaps the pain of pulling your hair is blinding you to the fact that I have already answered and addressed many of the things you raised in your last couple of posts. Quickly, I'll point out that Ashbaugh shows the upper thenar or mars mount to be the 1st interdigital area. He said and I already quoted this: "The thenar flexion crease develops with the appearance of the thenar pad and the first interdigital pad." The timing of the appearance of these two pads is not mentioned here, but Kimura places them both developing from 8 through 13/14 weeks. 13/14 weeks is the beginning of the appearance of the head line. 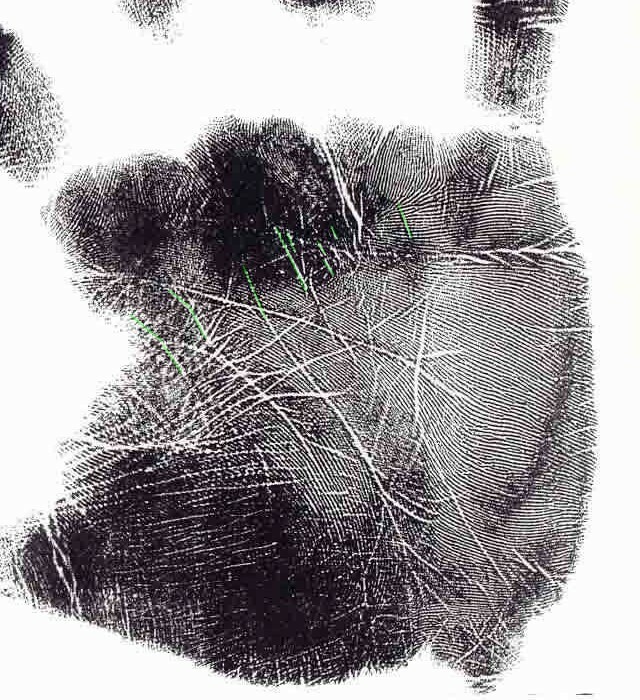 This image for a book copied from Google books - credits are in the image and earlier quote, states that the upper part of the thenar crease is influenced by the interdigital pad and the other lower part is influenced by the thenar pad. I commented on your aunt's palm when I first posted. I think both lines relate to the life line and the longitudinal line serves double duty. The life line is more likely to show changes as the tension between the thumb the thenar crease and fingers, is stronger than any tension affecting the hypothenar area. None of the palmistry authors contradict anything I have said either. Neutral information. If you are equating the life line to the thenar crease then placement is of utmost importance. You need to prove that your aunt's line does "not" qualify as a life line. You cannot as it fits a description for a life line. In this new example, RH, the fate line continues up to saturn mount, so I think it is a short lifeline and a long fate line. I don't have the same questions about this as I do about your aunts hands. I thought at first that the lifeline was reaching out to join the fate line, but on zooming I see the branch/fork at the end of the lifeline does not quite touch the fate line. If it had joined the fate line, I would have said that the lifeline is reaching out to the fate line for support and fate line takes over the role of lifeline lower down. But as it is, I would say short lifeline and 'normal' fate line. However the lower part of fate line has a break. Just below the break, is there a line coming from the fate line curling around the thenar mount at the base - where you might expect the end of the lifeline to be? (the ink is dark, the line is fine, so I can't be sure). Patti wrote: Perhaps the pain of pulling your hair is blinding you to the fact that I have already answered and addressed many of the things you raised in your last couple of posts. Patti, I don't understand what connection you see between those scientific materials and your description for my aunt's hand. "The thenar crease encloses the thenar eminence proximally and a shallow depression distally corresponding to the thenar space. The resistance in this depression is due to the adductor pollicis muscle." I think this passage only describes how the life line encloses both the mount of venus and mars-negative. What do you think that this passage adds to our discussion? Tamas --physical and sturcture :Rajas _energy and movment ; and Sattva , the balance, understanding , the light of a thing… These are Hindu concepts for cosmic forces…. The rajas: fears project from the subconscious easily, non completion of projects is common,sexual vitality may have problems . The Sattva: desire for more fullness in life, consciousness is very dominate to a point of very active on one's goals. (busy mind). This all makes sense to me; we kind of made the same assessment for this example - because we both speak of the combination of a 'short life line' + 'a normal fate line' (with no arbitrary issues involved). Regarding your notification that the radial wrist zone of the print is not very clear; I can say not much more than what I observe is that a likewise upward pointing line to the 5th finger is visible in the left hand: looks like a health line to me. "Just noticed the new example. I'd say the inner line is a short distal section, the longer middle crease serves double duty as both fate and life, and the crease farther away from the thenar eminence is a finger crease. I'd read all three pieces in combination. The middle line has a break away branch that continues to the fingers. The distal section of the life line has a break away section that proceeds toward the wrist. 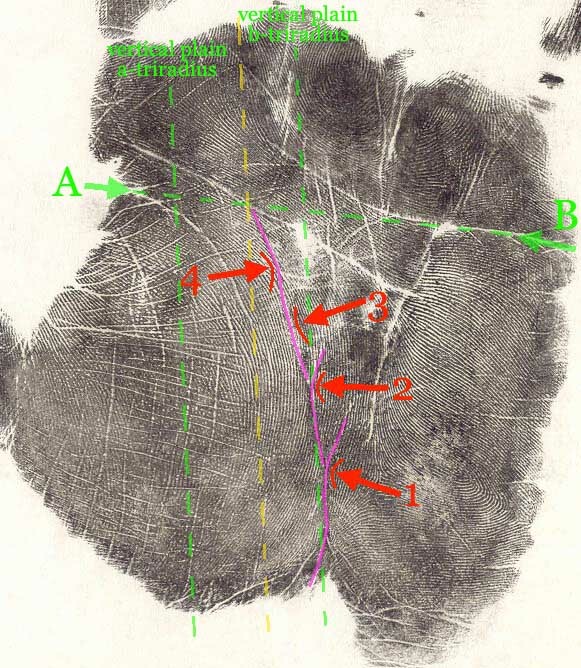 This middle crease serves the function of dividing the hypothenar from the thenar and acting as the solitary crease aiming to (or from) the carpals." I think one needs to be associating the accumulated information, especially from the medical and forensic texts. The fact that it forms in a depression while the rest of the thenar crease forms in the groove between the thenar and hypothenar eminence, muscles or pads, illustrate and support that these two crease do not always align. The short upper crease is only the initial start of the life line. The thenar crease is the crease that divides the thenar from the hypothenar eminence. On page 120 Kimura refers to Kimura & Kitagawa, and Lacroix etal, as observing the thenar crease as developing radially. 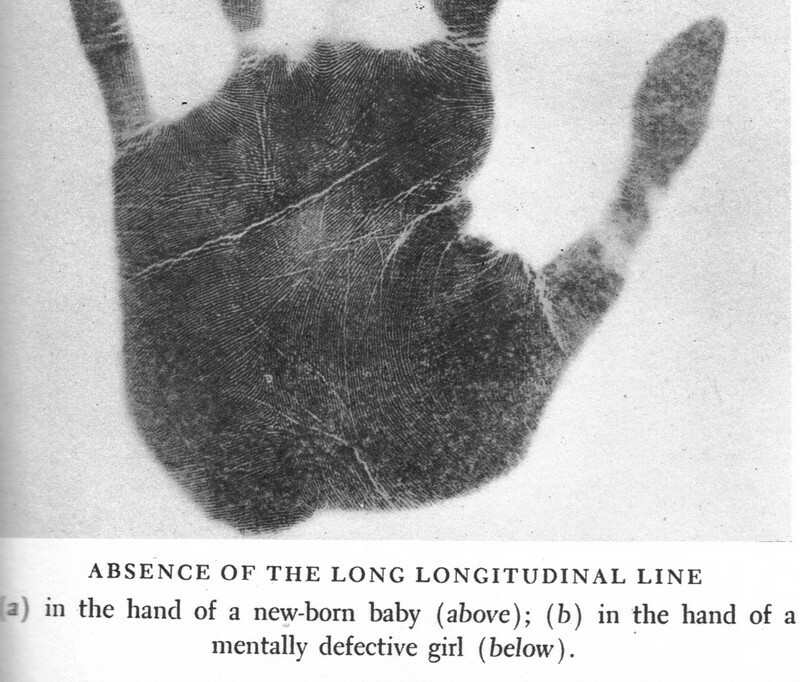 Kimura states regarding 8 weeks of gestations, "Thenar crease starts on the radial side between the thumb and index fingers." At 9 weeks "The thenar crease is clearly recognizable in the region between the distal and proximal components of interdigital pad I." At 18 weeks of gestation they describe how the flexion crease are formed as "grooves, or boundary lines, between pads or between pads or nonpad areas". The thenar crease begins on the radial side and the section in mid palm is based on the groove between the thenar and the hypothenar eminence. I have long observed the parallel nature of creases and their association with each other. 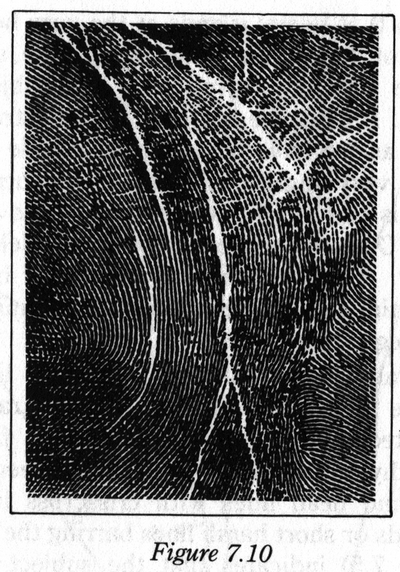 One of the medical descriptions of the creases included describing how creases line up in parallel sections illustrating a particular flexure movement or position of the hand. These relate to how the skin bunches up or flexes during this position. If you study these green lines for a while, it appears they might be related to pinching items such as a pen or eating utencils. Regardless of what activity formed them, I think they relate to each other. In the image below, starting from the thumb side, typically most hands have some sort of rising 'ambition' line that rises toward the inside of the index finger. I have colored this influence line or section, yellow. The green inner line is a short start of a life line, an inner life line or a Mars line. Further out a short green line appears from the head line down to the long longitudinal crease. Following the flow of the line colored in green in my earlier images - the section I colored yellow/green/orange is most likely formed as part of this group. The spacing is right for a crease in the bunching of skin during flexure. It does not rise high enough to transform the rest of the crease below into a fate line. The rest is colored green for life line. This green outer line forms the boundary between the thenar and hypothenar eminences. The orange creases are fate line related. These particular ones I marked are concerned with the middle finger the most. Patti wrote: If you are equating the life line to the thenar crease then placement is of utmost importance. You need to prove that your aunt's line does "not" qualify as a life line. You cannot as it fits a description for a life line. After I have already described in detail how the first three part of that line perfectly fit in the description of a fate line according LOCATION, PATH, DIRECTION; and these 3 parts do not show any characteristics that is very typical for a life line at all. And the same is also kind of true for the 4th part - except that this part shows a small 'curving' outward which can be associated with a life line (but the LOCATION & DIRECTION can certainly not be associated with a typical life line). "You cannot as it fits a description for a life line." So far you refused to present a detailed analysis + an explanation of which details in the print are decisive for you to describe the line as a life line and not a fate line. Well, okay... you want some 'proof'? 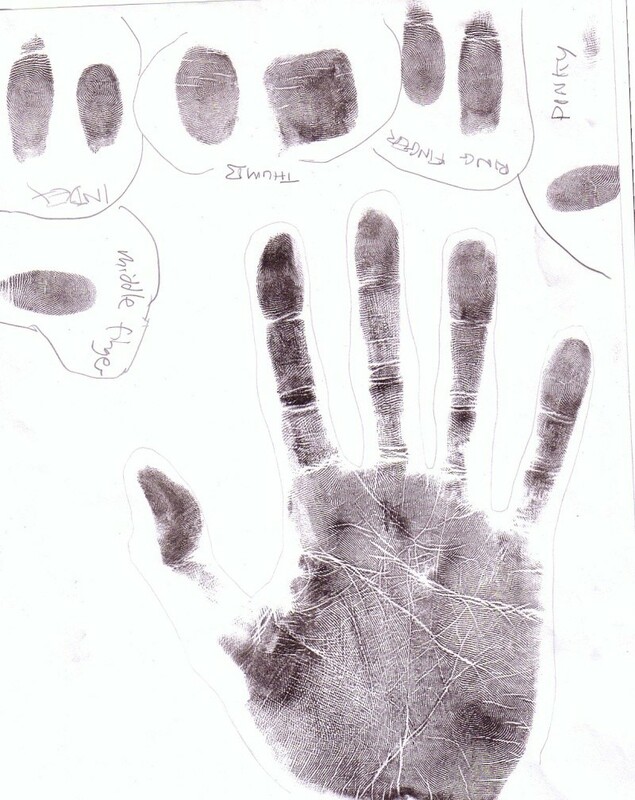 Patti, in my view you can simply 'proof' that my statement is not correct by finding a hand print example without a 'short life line variant' that shows the same characteristic for the life line. Now, after you asked for some 'proof'... I really hope that you will accept my challenge! PS. I assume the details about the vertical plains in that description make sense to you? If not I will explain my definition for the life line with a picture! Patti wrote: I think one needs to be associating the accumulated information, especially from the medical and forensic texts. Hi Patti, I confess I am struggling to understand exactly what point you are making with the texts you've presented above and on previous pages. Many of the quotes just describe the position or course of the lifeline and other lines. It is just telling us the course of the lifeline from base of Venus mount up to Mars mount. What point were you making about it? The fact that it forms in a depression while the rest of the thenar crease forms in the groove between the thenar and hypothenar eminence, muscles or pads, illustrate and support that these two crease do not always align. I'm not sure what you mean by two creases? The thenar crease first begins to form from the top ie radial side between index finger and thumb (in the 'depression' which refers to location of Mars mount.) It then grows downwards towards the wrist (in the grooves). what is the second crease you mention? sorry, you've lost me! Can you explain again what point you're making in the above quotes, cos I seem to have missed it!? The point I'm making (or trying to) is that each is based on different criteria in development. Each being the part of the thenar crease that forms in the interdigital space between the thumb and index, and the section of the thenar crease that forms in the boundaries between the thenar and the hypothenar pads. The upper formation is based on the develop and condition of the interdigital pad (mars mount) and the rest of the thenar crease forms around the thenar pad (Venus) between the thenar and the hypothenar eminences. This latter is influenced by the condition and shape of the thenar pad. These are the basic conditions the thenar crease forms under. 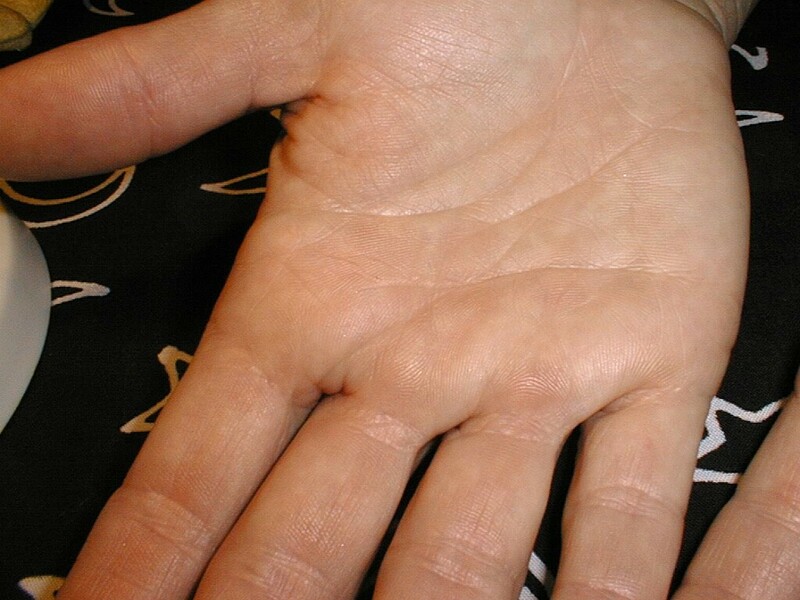 The middle finger crease (fate line) forms/develops under different circumstances than a thenar crease. It doesn't need to be in the groove between the thenar and hypothenar pads as it's a minor crease. If there's a crease that runs in this groove it is likely thenar crease related more so than middle finger crease related. I think the thenar crease is complete before the middle finger crease during development, particularly since it began forming weeks earlier. The part of your post that actually makes sense is the part where it seems you want a more detailed analysis from me regarding your aunt's creases than I did earlier. You also seem to be requesting I find some kind of hand with features similar to your aunts...? I did that earlier in this thread with examples from Wolff, Reid and others. 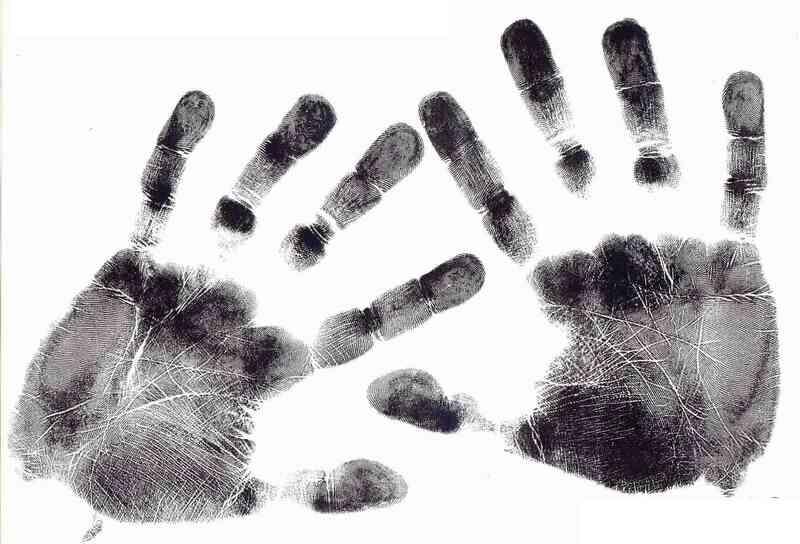 I looked through many of my hand prints and images that are on my computer and there are too many variations. Every hand has it's own unique combination of qualities. 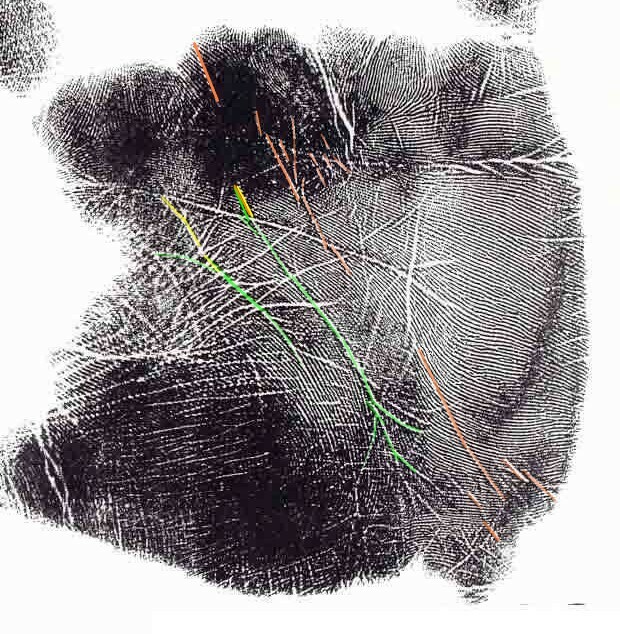 The lines colored green relate to the thenar crease. The radial section colored green, is made up of broken and overlaping segments, that appear almost ladder like. They are drawn together with a horizontal influence line also colored green. Another outer section green line is the continuation of the thenar crease. The red colored line shows some kind of influence. The red marked lines continue (without red coloring) toward the ring finger, fading out in the creases there. After this connection in the general area shown by the red lines, the energy shifts to the outer line and the inner line fades out. Green branches a little farther down show another reaching out between the two lines to connect (as well as uncolored influence lines paralleling the red one at an earlier time period). In the image below with the circled lines, the blue and yellow circles enclose areas of the crease that are disrupted. For me, this is another indication of a shifting of energy from one crease to the other. The first set of aqua arrows (highest up) point to where the inner line begins to fade into a dermatoglyphic groove and the outer crease shifts directions. The next set of aqua arrows point to boundaries of an area of the crease that curves inward toward the life line. This coincides with the absence of the inner crease. Now the flexure/extension tension is between the proximal phalangeal crease of the thumb and this thenar crease that is more deeply attached in the skin layers as compared to other creases between it and the thumb. Thumb movement and stance has likely pulled this area towards it. This section is the life line and not fate line related. The next set of aqua arrows point to a straight piece of this crease. It is a combination section. It could be seen as a piece of fate line bridging the life line. I see it as a mix of the two. Both fate and life. I colored it orange and green. I think the straightness indicates this section is more influenced by the index finger and hypothenar rather than thumb. Ironically, the dgs are straighter on the thumb side and are actually curved in the opposite direction on the hypothenar side. An orange colored branch rises with a mix of moving toward the ring finger and the middle finger. In a ladder like way it branches both ulnarly and distally. I see it as part of the flow of ridges I colored orange under the middle finger. The orange colored lines are fate line related. The next branch rising upward from this crease is colored both orange and purple. This section is shown by the last set of aqua arrows. These creases are aiming to the ring finger so I would call them sun line related, but they flow with the upper creases colored orange as well. Purple are ring finger or sun line related. The pink lines are Mercury or health lines. The life line continues around the thumb colored in green. It appears to become broken segments maintaining itself within thenar side of the main line from the t triradius. Faint lines branch toward the ulnar side of the wrist. Patti, I now recognize that where I mentioned the dissociated head line this kind of became a confusing element regarding the point I was trying to make. So, I apologize for this confusing element (which might have made it look like as if my request included a contradiction). A life line will never enter the 'upper palmar zone' at the ulnar side of the triradius below the index finger. A fundamental guideline... which could help us to finish this discussion! Any normal life line will not pass the 'virtual horizontal plain A-B' (see picture below) at the ulnar side of the a-tradius below the index finger. We can see in the picture that the fate line in my aunt's hand does reach out to the virtual line A-B at a point below the middle finger (at a point only about 1 cm at the radial side of the triradius under de 3rd finger). And this is actually a very typical characteristics for any fate line that is long enough to pass the head line! Sorry Patti, for this reason I observe that the fate line in my aunt's hand can VERY LIKELY not be said to show the typical 'placement' (quoted from your words) for a life line: because it violates the sensible guideline that I presented above! Patti, in my view you can simply 'proof' that my new statement regarding the virtual horizontal plain A-B is not correct by finding a hand print example without a 'short life line variant' that shows the same characteristic for the life line. Will you now accept my challenge? Quoted from my post above: "A life line will never enter the 'upper palmar zone' at the ulnar side of the triradius below the index finger." Applying this rule to Parender's example shows that this example is much more 'arbitrair'... because this example does not violate the rule above at all! And in this example the line under discussion also shows a 'curve' that is very typical for a life line... so I understand the associations with the life line. However, the line under discussion is does end under the middle finger... which concerns a characteristic that is much more typical for a fate line. And I could add that the upper few cm's of that line are slightly 'curving' outward towards the middle finger. 2 typical characteristics for a life line + 2 typical characteristics for a fate line. However, I observe that the upper part of this line looks more like a fate line than a life line! So, my doubt for this case is kind of focused on the lower part, however since it is not unusual for a fate line to have such characteristics in the lower part of the line... I tend to continue to give my support for Parender's assessment. I had not commented on that one so far, but I perceive that in that example the life line manifest via two rather weak short life lines + a much stronger mars line. I associate the stronger line parts near the wrist with other lines: fate line (3th finger line) and health line (5th finger line). Obviously, in this example reaches out beyond the virtual horizontal A-B plain. So that confirms my earlier assessment as well... as it also violates my new guideline regarding the life line! I had not commented about them so far, but I think it is obvious that those do not show much similarities with my aunt's example (and none of those violate my new guideline). - Ad 1) It's hard for me to comment regarding the Charlotte Wolff example, because the lines are not very clear in that picture at all. - Ad 2) I don't think that any experienced palmist would even start thinking of a 'short line', because obviously that is actually just an example of a 'broken' life line (according the definition presented in the Korean article). - Ad 3) I don't want to make any comments about that example, because I think it is obvious that we can only see a very small part of the palm... which makes it kind of impossible to see what is really going on there. I would prefer to see guidelines that relate to the thenar crease regarding it's location between the thenar and the hypothenar eminences. The finger creases would more likely be influenced by the fingers. However, I do see your association, as I can tell you have recognized the influence of the index finger on the life line's direction. As far as slicing the hand vertically from the triradii, no. I do think it's not very kind of you to ignore much of what I've presented from science and medical texts and then expect me to get excited about some unsubstantiated theory you have presented out of the blue. Patti wrote: I would prefer to see guidelines that relate to the thenar crease regarding it's location between the thenar and the hypothenar eminences. Patti, just like we can see sometimes that a head line can 'cross' a life line... likewise patterns are seen for the variations of the fate line and life line near the central wrist zone. So, this time your request does not make sense for me at all... because your experience should have told you that the typical variations for the life line and fate line in the carpal zone of the palm show a large amount of overlap! And for this reason it is quite surrealistic to see you suddenly asking now for any guidelines in terms of 'proof' regarding the carpal zone of the hand. By the way, meanwhile your requests start showing an endless pattern of 'jumping-away' from the implications of my answers to your requests and remarks... by simply making new requests. Because after so many years you should have known by now that the major differences between a fate line and a life line are found in the central zone of the palm... and not in wrist zone!! PS. Regarding your final words... Patti, by fact: I have posted many responses to your postings where you presented references to scientific materials... so your complaint shows a lack of specificity (and as a matter of fact, your complaint goes far beyond the truth regarding the detailed content of my responses to your posts). 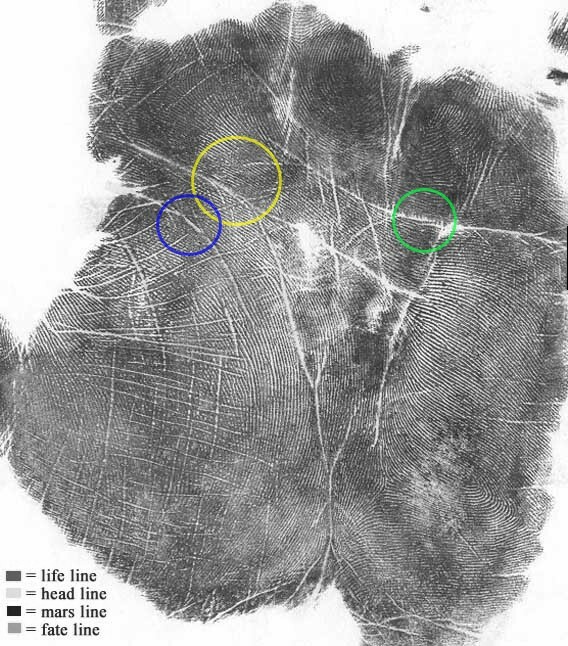 By the way, I hope you will understand the implications of my comment regarding the 'overlap' between the life line and fate line in the carpal zone. Because your attempt to search via scientific materials for finding some kind of exclusive 'proof' regarding the characteristics for the fate line and the life line in the carpal zone... is actually kind of a 'mission-impossible' - for, the 'overlap' of the most common variations between both lines is actually by fact: considerably large. Again, a likewise large 'overlap' is seen in regarding the starting point of the life line and head line! And therefore it would have only made sense if you had asked for specific 'proof' regarding the upper part of the lines that we have been discussing! 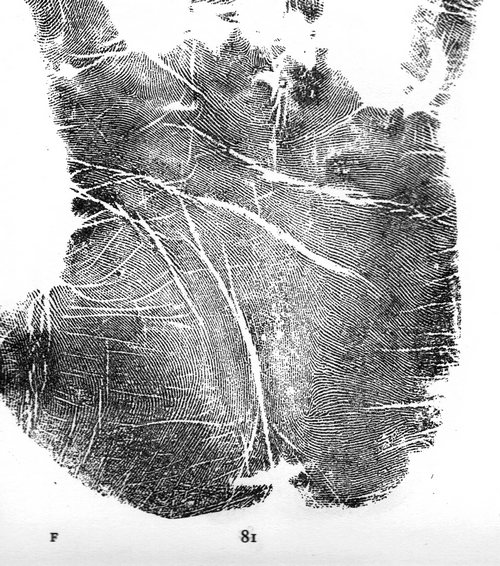 Creases naturally fuse with other creases once they leave their normal territories, such as the merging of the heart line with the head line in the simian crease. The life line often fuses with the head line as well as the fate line. The fate line and head line often fuse. Most of the time you can, with a close look, find features that show where they meet, merge or overlap. Here's an example of unusual fusions of major creases. [color=darkred]Patti, just like we can see sometimes that a head line can 'cross' a life line... likewise patterns are seen for the variations of the fate line and life line near the central wrist zone. Perhaps it'd become less surreal if you studied the dermatoglyphics in this area. odd... I thought exact same thing of you! The fate line and head lines are not as restricted in their boundaries as is the life line. Therefore, the fate line location at the wrist is widely variable. It is rare for the life line to expand beyond the t triradius' main lines, particularly when this triradius is nearer the wrist. I'm glad you are at last acknowledging the central zone where the fate and life lines fuse. This location is obviously the boundary between the thenar and the hypothenar as I've been saying all along. Patti wrote: The point I'm making (or trying to) is that each is based on different criteria in development. Each being the part of the thenar crease that forms in the interdigital space between the thumb and index, and the section of the thenar crease that forms in the boundaries between the thenar and the hypothenar pads. Aha! Ok thanks. So you're just talking about development & embryos. I guess I was trying to read something into it, making it more complex than it was! It doesn't really help us with identifying the lines (thenar crease/fate line) on the hand after they've formed tho does it? We'd have to see it during development to determine whether it formed in the groove or not! Once the main lines form in the fetus, they are permanent. The boundary between the hypothenar and the thenar is permanent.